At my first post on this topic, back in January 2010, looking at severe real S&P 500 bear markets I postulated whether once the governments of the world stopped stimulating their economies through borrowing and quantitative easing whether we could see a real -60% bear market from the previous high within this economic cycle. Well as I highlighted here there still seems to be life in governments (or their agencies) yet with the recent QE Lite announcement. The economy that seems to have been created from all the manipulation seems to be allowing walking dead companies (I rank a lot of banks under this category, particularly some of the European banks and their nonsense stress test results) to survive rather than quickly clearing the dead wood and allowing young saplings to start in their place. A classic example of this (as highlighted in last weeks MoneyWeek) is to look at the US with its Fed creating out of thin air (quantitative easing) 1.3 trillion dollars by buying government bonds and other assets. However in parallel to this the banks have deposited 1 trillion dollars with the Fed, rather than lending it out, as they frantically try and rebuild their balance sheets. So we have a manipulated economy in which the banks hoard cash to pay for future losses that they must be expecting but aren’t saying anything about. At the same time we are seeing articles like this looking at the future postulating that we may not see a double dip recession but rather something worse, a lost decade. Its easy to see how this hypothesis is arrived at however today I’m not even going to talk about the future. Instead what about the last 10 years? If you owned S&P 500 shares it’s already been much worse than a lost decade. The S&P 500 as I write this post is hovering around the 1,100 mark. To put that into perspective the S&P 500 when looking at nominal monthly average pricing first passed the 1,100 mark in April 1998. Sure companies have paid dividends over that time but importantly, when assessed by the market, in over 12 years, companies have not been able to achieve any growth that results in them being valued any higher. Of course when you take out inflation to put things into real terms it is much worse. As I do every month today’s post looks at exactly this. 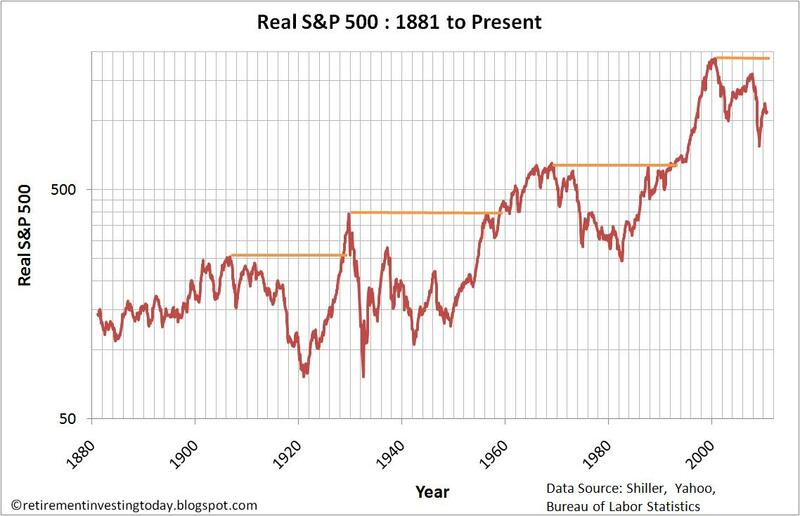 Real inflation adjusted long term bear markets. 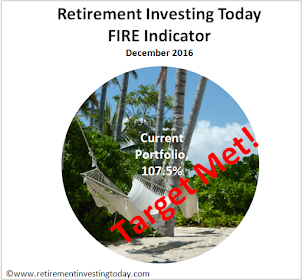 Firstly though as always let’s cover the background to today’s charts for the new readers of Retirement Investing Today which includes looking at other severe S&P 500 bear markets as a comparison. 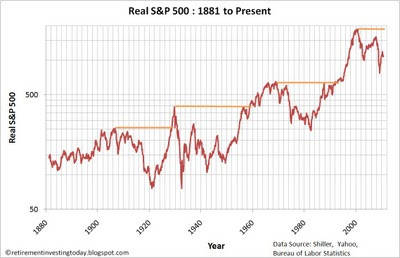 Today’s first chart shows the real (inflation adjusted) S&P 500 (or its predecessor) stock market from which I have identified three historic severe stock bear markets. These I am defining as stock markets where from the stock market reaching a new high, it then proceeded to lose in excess of 60% of its real (inflation adjusted) value. 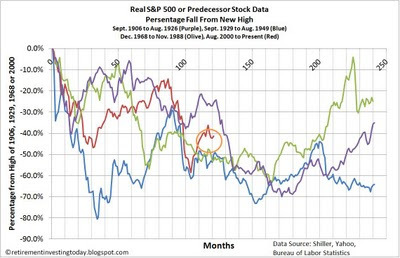 These are best demonstrated by the second chart which shows each of these stock bear markets and the fall in percentage terms from the peak. So briefly what were these bear markets with the full background here. So that brings me, as always, to the last line on the chart marked in red which shows the real bear market that we are currently in. This period began in August 2000 with the Dot Com Crash however we were unable to reach a new real high before the Global Financial Crisis took hold. In this real bear stock market we have been unable to break through -60% ‘only’ reaching -58.6% in March 2009. That is a period of only 8 years and 7 months. - in 1916 at -25.5% and over the next year heading to -47.9%. - in 1939 at -49.9% and over the next year heading to -58.8%. 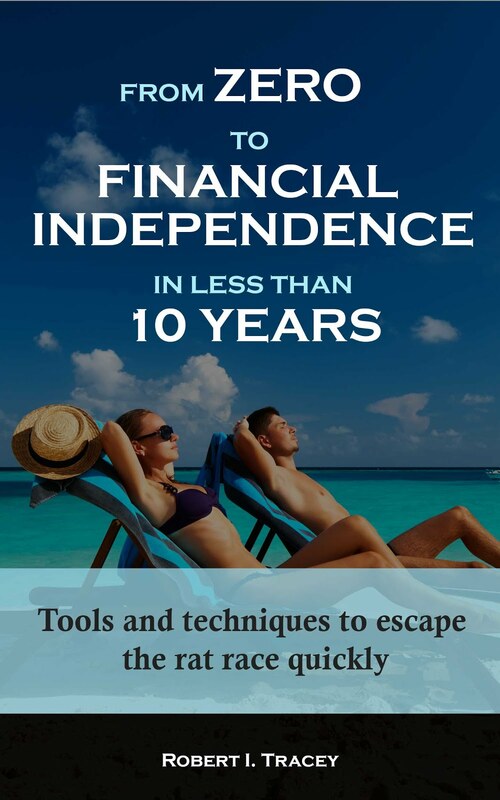 - in 1978 at -52.7% and over the next year heading to -53.2%. I’m going to keep watching this comparison as I think it continues to get more interesting by the month. Could we yet see that real -60% bear or even a -70% or -80% bear? History suggests there is still plenty of time for it to occur. - Inflation data from the Bureau of Labor Statistics. July and August 2010 inflation is extrapolated. 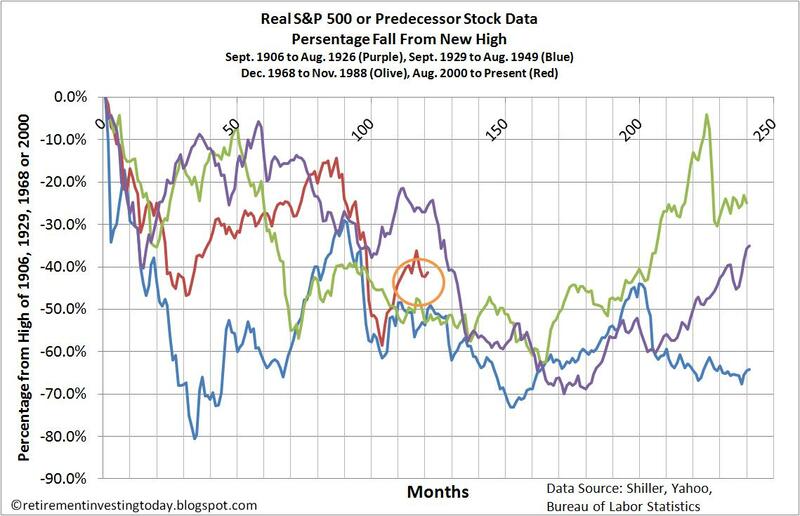 - Prices are month averages except August 2010 which is a 17 August 2010 intraday S&P 500 stock market price of 1097.16. - Historic data provided from Professor Shiller website. Could you please post an update to the second chart? I've been watching this, and it looks like we are on the verge of breaking above the purple line, rather than spinning downward. Though as you said, there is still plenty of time. Thanks.